So, we’re 3 weeks into the New Year and I’m starting to feel frustrated. I want to lose 30 pounds that I’ve been holding onto since I had my last child 3 years ago. My New Year’s Resolution this year was to lose the weight, eat better, and to have an overall healthier lifestyle. Well, I’ve lost a total of 1 pound so far despite feeling like I’m working overtime to reach my goal. How do I stop myself from giving up now? I’ve heard this scenario countless times over the past few years. The core of this problem is that we’re focusing on losing that 30 pounds (long-term goal) and losing sight of the small victories we make each day. That’s where short-term goals, which are SO important, come into play. We all have long-term goals or things we want to achieve during our lifetime. But, it’s the effort and the dedication we put in everyday that finally makes those dreams a reality. I’m sure you’ve heard this a million times, but it’s true, goals are achieved through consistent effort each day. So, what should you do instead of thinking about losing that 30 pounds? Set realistic short-term goals for yourself. If you have a weight loss goal, don’t focus on the total amount you want to lose. Losing a large amount of weight is too far in the future. When a goal seems too far out of our grasp, we tend to lose sight of it and give up…we humans are not so good with delayed gratification. Instead, regularly set realistic short-term goals. What’s that look like in real life? Well, it’s safe and realistic to lose about 1-2 pounds per week (remember to lose one pound, you need a 3500 calorie deficit—that’s a lot of calories!). With that in mind, set a goal to lose 1-2 pounds in a given week. You’ll be more likely to achieve it because you’ll see results faster (and, you know, instant gratification). Which leads me to my second recommendation…. Reward yourself for small victories! Rather than waiting until you’ve reached your goal of losing 30 pounds, reward yourself each time you reach one of your small, short-term goals. Lost a pound this week? Reward. Got a workout in 5 times this week? Reward. People work best on a reward system—why do you think you get paid so frequently from your job? If you only got paid once a year, you’d probably lose motivation pretty quickly—same goes for your fitness goals. Oh, and food is NEVER a reward, it’s to nourish your body. When I say reward yourself, I mean have a plan of what that reward will be, but make sure it’s something that motivates you. Change your focus to being fit, not skinny. Ok, so how did you decide you needed to lose 30 pounds in the first place? 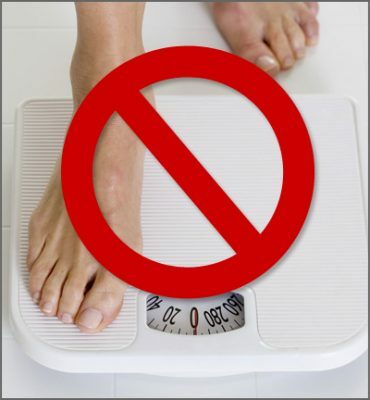 It may sound like the perfect amount of weight to lose because that’s what you weighed pre-babies or because that’s what the BMI chart says you should weigh. But, honestly, being fit is totally different than being skinny. Your weight really doesn’t mean a whole lot—it’s more about how you feel. True fitness has nothing to do with weight. Two people could weigh the same exact amount and be of the same exact height, but based on their fitness levels look totally different. Why you ask? Body composition. As you become more fit, your body becomes composed of more lean muscle tissue and less fat tissue. Muscle is more compact than fat, so it takes up less space although it weighs more. So, it could be that the scale isn’t budging because you’re actually become stronger and your body composition is changing. Check in with that. Do your clothes fit differently? Do you feel like you have more energy and stamina to get through your day or workout? These are the things that really matter, not some number on a scale. So, there you go—quit sabotaging yourself with unrealistic expectations. All goals are achievable if you have the dedication and consistency to stick with them for the long-term. But, long-term is hard, so for now focus on the short-term, celebrate your small victories, and quit focusing on the scale.